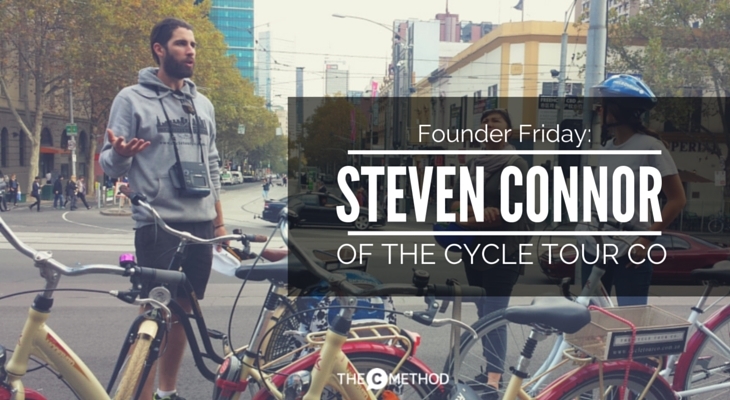 This week, I’d like to introduce you to Steven Connor, founder of The Cycle Tour Co. He helps visitors and locals experience a side of Melbourne they’ve never seen before, by taking them on fun bike tours of the city. Why did he start The Cycle Tour Co? A few years ago when travelling around Europe, Steve met up with a friend in Barcelona. His friend had spent a couple of seasons working with Fat Tire Bike Tours, and suggested he give it a go. Steve applied for a job, and after 9 days in Barcelona, was an official tour guide! 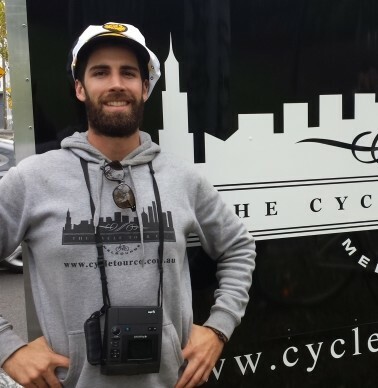 So he came back home…and The Cycle Tour Co was born! What’s so good about cycling? I asked Steve – why bike tours? Why wouldn’t someone do a walking tour or jump on the free trams? I have to agree. There’s something about being on a bike that makes you feel free, right? I mean, no seatbelts! No wonder Steve loves his job – “My job as a tour guide is to make sure that people enjoy being on a bike, being in a group, and enjoying the city.” He says that sometimes it even spurs people on to get cycling again, to go home and dust the cobwebs off their old bikes. That’s something to be proud of! Do you get sick of talking about the same things over and over again? I ask. Steve explains that each tour is different, as he tailors them to the group. For example, some people may be really interested in architecture, or the city’s history, or some may simply want to check out a few bars. So that’s a win for both him and his customers! I used to cycle a lot (mostly to avoid paying public transport fees), but since I’ve been back in Melbourne, I haven’t had much opportunity to get my wheels out. So I was super excited to try out one of Steve’s tours. We started off at the Flagstaff Gardens, where we practiced getting used to the bikes. While the ‘back pedal’ braking system evoked memories of my old childhood BMX, in practice it required some serious concentration. The neat little baskets are the perfect size for your handbag! But I did like that the bikes are quite new and have very subtle branding. Steve wanted his bikes to “looks like a bike you would ride at home” and not have people feel like “rolling publicity stunts”. Try not to kill any pedestrians. Unless they’re on a segway. And with this sage advice from Steve, our bicycle tour of Melbourne began. We headed off down La Trobe street (the only part of the tour on the road), and around the back of RMIT University, where Steve told us stories of Ned Kelly* and how he was kept in the nearby gallows and did lay ups on the oldest basketball hoop in Australia. Or something like that. Did you know that Kelly had a petition of 60,000 signatures of people who opposed his hanging? Considering the population of Melbourne was only 400,000 at the time, it wasn’t a shabby following. He would have had a serious Twitter tribe if he were alive today. But I digress. We continued up to the Melbourne Exhibition Building (Australia’s only UNESCO heritage listed building) and then stopped for a rich affogato (espresso with vanilla ice cream) opposite Parliament House. 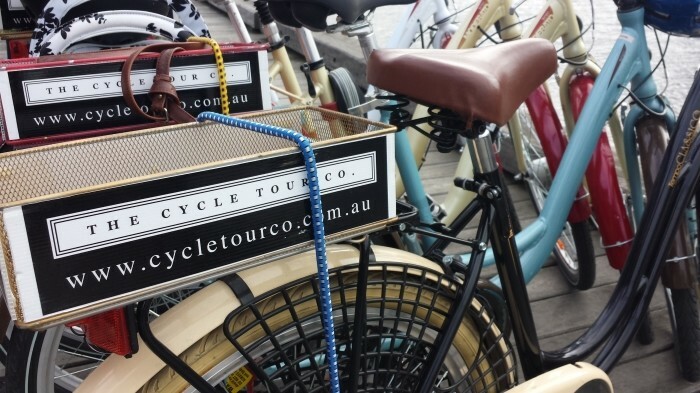 Other sites we rode to included the MCG, Federation Square, the Yarra River, South Wharf and the Docklands. All the while, Steve made sure we were doing ok, stopping for frequent breaks and taking time to share stories about Melbourne’s history and significant buildings. If you’re a visitor to Melbourne, it’s a no-brainer. Go do a bike tour. 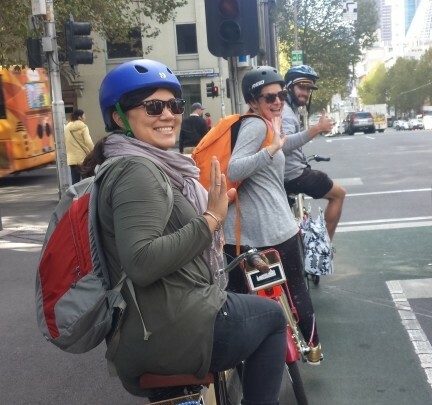 If you’re a local – cyclist or not – it’s an awesome way to experience Melbourne from a different perspective. I’ve lived most of my life in Melbourne, and I still discovered places I’d never seen before. Being a ‘tourist’ in your own city is actually quite fun, and being on a bike heightens your senses and makes you so much more aware of your surroundings. And it tests your co-ordination with filming on your phone and dodging people at the same time (recommended for only highly experienced idiots). *Australia’s most infamous criminal. Killed policemen. Stole sheep. Had an epic beard. Glad you liked it Angie. Thanks for stopping by! Hope you are doing well with your new business,what a great idea. Next time Rob and I come to Melb,we will book a tour. Our typical tours run for about 3-4 hours and usually commence at 11am, the cost is $45 per person.